Link and Zelda are en route to a distant kingdom when their boat is attacked by a pair of pirates. The men take them to the tropical continent of Sootini; the gateway to the Hall of the Dead. 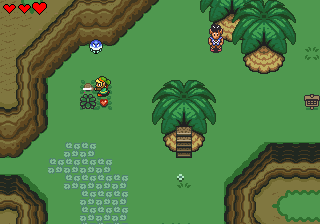 They hold Zelda hostage, refusing to release her until Link brings them the mystical Staff of Istalin. 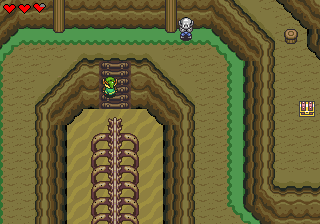 The Legend of Zelda: Hall of the Dead is a fan game created in Game Maker and released sometime in 2007. It’s a fairly rudimentary game, but isn’t without its charms. 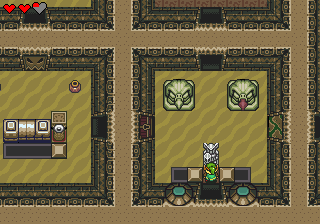 The gameplay is mostly inspired by A Link to the Past (obviously), but also takes cues from a few other famous games. The equipment system is more akin to Four Swords Adventures where you can only hold one item at a time, and the overall progression system has more in common with Super Mario 64 than it does a Legend of Zelda title. 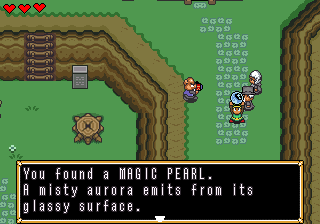 You still explore the overworld looking for dungeons, but the main goal of the game is to collect as many of the 100 magic pearls as you can. The more you find, the more areas you unlock. Try to find them all! This page was last modified on 11 April 2019, at 17:49.